Auto maintenance is very important to keeping your vehicle in tip-top shape. Your vehicle’s Owners Manual, located in your glove compartment, has a list of services and a schedule, usually based on miles driven, for when to have your vehicle maintained. One of the most important things you can do for your vehicle is change the oil at specific intervals. Motor oil is the life-blood of your engine and will slowly break down with use. There are many manufacturers of oil, but since it is so important we only use Castrol Oil. Castrol is a leader in developing engine lubricants and their research and development teams have formulated superior oils for different engines focusing on performance and longevity. Luckily, in this age all modern vehicles are controlled by computers, which when there is a problem, will light up a Check Engine indicator on your dashboard. We have engine scanners that can analyze the problem and tell us which part to that needs to be replaced. Brakes: Pads, rotors, master cylinder, fluid. Air Conditioning: Freon, Compressor, evaporator, drive belt. Cooling system: Radiator, Anti-freeze fluid, fans, water pump and drive belts. Electrical systems: Batteries, Alternators, Starters, Lights, Fuses, wires. Suspension and Steering: Lube Chassis, Shock Absorbers, Power Steering pumps. Tune-up: Spark Plugs, Wires, Distributor Cap and components. Automatic/Manual Transmissions: Change oil and filter. Fuel system: Fuel pump, Hoses and Filters. 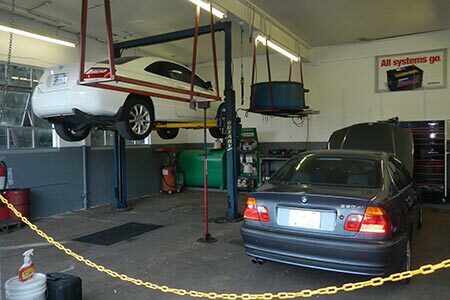 We also do major repairs such as Engine and Transmission replacement. We offer free estimates for our services and we warranty our work for one year as well as the manufacturer warranty of the part we replaced.